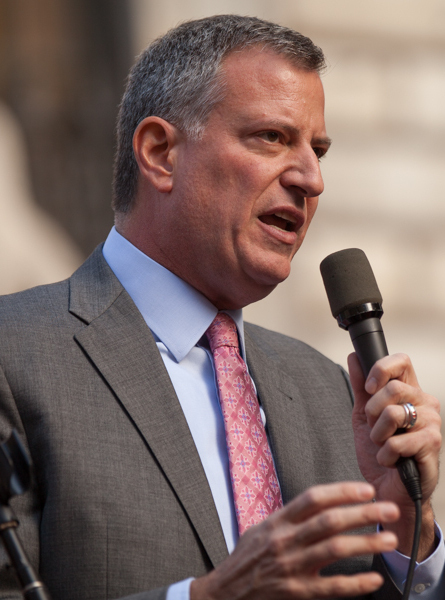 Appearing with WNYC’s Brian Lehrer for his weekly “Ask the Mayor” segment this morning, Mayor de Blasio said the city’s Vision Zero effort is “still in its infancy” and that “there’s a lot more to do.” The remarks come at a time when the city’s two-year run of reducing traffic deaths seems increasingly unlikely to continue in 2016. While the mayor said “traffic designs” are an important component of Vision Zero, he did not say that he intends to accelerate investment in safer street configurations. A caller had asked de Blasio why the city’s Vision Zero policies do not target pedestrian behavior. “People have to take personal responsibilities,” the caller argued, suggesting that the city pursue pedestrian education or jaywalking enforcement. The core of the problem is not the pedestrian or the bicyclist, it’s the person who’s driving a vehicle and is speeding, or going through an intersection without yielding to pedestrians. That’s what Vision Zero is first addressing, but we have given tickets to bicyclists who endanger others, we have given tickets to pedestrians who put themselves in harm’s way and could create an accident that could affect many others. We’ll do that in some measure, but from a resource perspective and just in general, that’s not where our first energies are going to go. Look, any death is one death too many. We don’t accept any of them. And that’s part of the core notion of Vision Zero, is recognizing how many deaths and injuries were avoidable from the beginning: if we had the right traffic designs, if we had the speed cameras, if we had a lower city-wide speed limit, which we’ve done as well with the help of Albany and the City Council. All of these things have changed the reality, but there’s a lot more to do. While speeding and failure-to-yield enforcement has increased, there is wild inconsistency between precincts. In many parts of the city, police issue more tickets for tinted windows than for motorist violations that put people’s lives at risk. Local precincts still respond to cyclist fatalities by going out and ticketing cyclists the next day. Meanwhile, the city has maxed out the number of speed cameras permitted by Albany, and getting authorization for more in the next legislative session is no sure thing. What the mayor can do on his own initiative is redesign the city’s streets. But for multiple years in a row, de Blasio hasn’t heeded calls from advocates and City Council members to increase funding for street redesigns. As Transportation Alternatives director Paul White told Politico’s Dana Rubinstein, the mayor “is not wielding his full power to prevent” traffic fatalities. To make a more visible impact on reducing traffic deaths, the mayor will have to make a more visible commitment and devote the financial and political resources needed to transform the city’s streets. And this is why Vision Zero (as it currently stands) is doomed to fail: instead of smart, comprehensive design (sometimes CB’s be damned), we just get the rhetoric of enforcement and punishment. Good response from De Blasio to the Ticket peds guy. That said, a hard hitting interview would have asked about the ped islands on Eastern Parkway, the automatic victim blaming by NYPD, and the closure of a major bike route during rush hour with no alternative. It’s too bad Brian Lehrer doesn’t do hard hitting. The mayor typically deflects any and all criticism of his progress on safe streets by saying that he’s doing more than anyone before him or that pedestrian deaths really did go down in the first two years of the initiative. He thinks anyone who complains isn’t being fair. That’s fine in a generic “safe streets” sense, but not in a “Vision Zero” sense. More bike protected bike lanes this year than ever before? Not that difficult when bike lanes aren’t the third rail that they were when JSK set out to change a few Manhattan avenues, so why isn’t he doing more? Increased enforcement? It’s not that hard to improve on the zero speeding tickets that many precincts were writing before Vision Zero, so why isn’t he calling out pointless bike ticket stings? I think he gets the vision of Vision Zero, but doesn’t understand the practical steps it will take to get there. Or he does and is too afraid to lose votes to the avid parkers who would scream bloody murder if he changed their street to save a few lives. And as you note, without increased funding it’s all talk. More bike protected bike lanes this year than ever before? /blockquote>This stat is also being seriously juked by VERY low hanging fruit. While far outer borough Greenway connectors are great, they’re not really providing the same level of utility that finishing the protected bike lanes on the Manhattan Avenues or filling in gaps in the core network would. This year they’ll build more mileage of protected lanes which will be used by fewer people than ever before. Also, as in the Marine Park case, they’ll remove them at the first sign of opposition despite having gone through a long community engagement process. He can ask really good questions–wish he would push harder on this. Should have asked him about turning down $50 million for safe streets from the City Council. How many painted/plastic safety features that are already approved by Community Boards could be poured in concrete with that money? When will his words be matched with actions? Exactly ….even CBS like MCB4 ask for it… Why not install all the safety improvements in the CBs that ask for it and then show the results to the reluctant ones ? Isn’t it the way you effect change? If we all apply to participatory budgeting and get funding for safety projects we can make a dent .. That is our plan for 5 split phase signals atthe 5 most dangerous intersections in our district per DOT’s pedestrian safety action plan…. There is an easy response to people like the caller. For decades, every time a pedestrian or cyclist was killed and not there to tell their side of the story, they were publicly blamed for their own deaths. People were led to believe that drivers were innocent 100 percent of the time. With the widespread use of cameras, however, we now see that was a lie. We see the reality is that pedestrians and cyclists are to blame only some of the time, and drivers are to blame most of the time. And that furthermore drivers could have prevented many of the tragedies that were not their fault if they were going slower and paying better attention. When pedestrians and cyclists start killing and maiming people in motor vehicles in large numbers, they will be a bigger enforcement priority. And yet when the motorists start proving that it was the pedestrian or cyclist with a dash cam, than maybe the callers claims will be taken seriously. I have caught many cyclists on video endangering themselves, while riding their bicycles unlawfully. Don’t ever forget those cameras can be turned the other way around and expose dangerous behavior from cyclists & pedestrians. I have caught many cyclists on video endangering themselves, while riding their bicycles unlawfully. Laws exist primarily to protect people from dangers imposed by others. I am a pedestrian. In the past week, dozens of motorists endangered my life. I also had to wait a few seconds for one or two cyclists who were breaking the law, but they were traveling slowly enough, and using light enough vehicles, that had I not waited I would have suffered minor bruises at worst. Pedestrian and cyclist fatalities are overwhelmingly caused by motorists who break the law. Scolding pedestrians and cyclists won’t get us any closer to Vision Zero. Consistently penalizing drivers who illegally endanger other people’s lives will. Don’t ever forget those cameras can be turned the other way around and expose dangerous behavior from cyclists & pedestrians. Sounds great to me! Let’s use cameras to help us arrest all those pedestrians who endanger motorists’ lives and all those motorists who endanger pedestrians’ lives. If I am crossing the street with the walk signal in my favor, or at a stop sign, the law grants me priority over motorists. If a motorist and I are approaching at the same time, the law is clear that I go first and the motorist waits for me. If you come along in your car and strike a pedestrian to whom you were required to yield, you are 100% at fault. Regardless of whether the pedestrian looked (and what the pedestrian did after looking) and regardless of whatever else the pedestrian might have been doing at the time. Because it was the pedestrian’s turn to go at that time, not yours. Personally, I always watch for approaching traffic when I cross the street, even when I unambiguously have the legal right-of-way, because so many motorists fail to yield. That doesn’t mean I stand by idly as motorists continually cut me off – if it did, I’d never be able to get across the street. If I can find a safer place to cross the street, such as mid-block (where turning motorists don’t pose a hazard) when no traffic is approaching, I generally do. Otherwise I cross in the crosswalk with the light in my favor, fully cognizant of the risks imposed by motorists like you. Take responsibility for your own actions for a change. 1) In NYC riding or walking “unlawfully” is often safer. For example, it’s usually safer to cross a street midblock or against the light. And when cycling, it’s often safer to pass red lights so you avoid the platoon of cars jockeying for position when the light changes. Obviously in both these cases a cyclist or pedestrian should ascertain if it’s clear before going against the light but nearly everyone does so out of pure self interest. The “kamikaze” pedestrians or cyclists motorists love to blame largely don’t exist. The point is “the law” is mostly designed for rapid throughput of motor vehicles, not for safety of vulnerable users. Following the law doesn’t guarantee safety for either pedestrians or cyclists, and violating it isn’t necessarily dangerous. 2) Cyclists and pedestrians rarely do things to endanger their own lives so your hypothetical videos of them doing so largely won’t exist. 3) As Andrew mentions pedestrian and cyclist fatalities are overwhelming caused by drivers breaking the law. Even when the cyclist or pedestrian might be partially at fault, they need not have died had the driver been going at or under the speed limit. 4) We don’t need a nanny state to punish people who endanger only themselves. That’s usually the only people cyclists or pedestrians might endanger if they’re careless—themselves. On the other hand, careless motorists endanger others. I want attention to focus on the most dangerous road users. That’s people in motor vehicles by far. Ok, so you want to ignore traffic lights, I hope you are yielding to cross traffic, and if you get hit, I hope you are honest and say you treated the red light as a yield sign. As for crossing at mid block, you yield to motorized traffic. If you suddenly walk out in front of someone don’t blame the driver for your stupidity. Actually those videos exist all over youtube of unlawful & dangerous behavior of cyclists and pedestrian. I have even gone out and caught unlawful & dangerous cycling on video because of the arrogant bicycle lobby wisconsin has. They are the reason I started my blog, because of their condescending attitude towards others that disagree with them. So don’t feed me that bicycle lobby trash that these people don’t exist. The fact of the matter is that a bicycle can kill, or seriously injure a person even at low speeds. There has been news on it as well, but you won’t find it on anti-car websites. As for vision zero, it should be called zero vision, as it doesn’t educate pedestrians or cyclists, they seek to only put all the education on to motorists which is why vision zero continues to be a big epic fail. Unfortunately, to save these people from themselves, we apparently do need even more of a nanny state. I would rather focus on pedestrians & cyclists, and motorists, trying the same old failed way over, and over again will yield the same results, now it is time to educate pedestrians & cyclists how to stay safe. Did you look both ways before crossing? Or did you use the “no look” law? What I mean by “no look law” is that did you step out in to the cross walk and expect everything to stop on a dime? Pedestrians think they always have the right of way, that is what they were told, but they aren’t told not to suddenly leave the curb. Yet on most department of transportation websites that list rules and pointers for pedestrians it is mentioned. Looking both ways is never mentioned any more. Slow moving bicycles can still cause serious injury, or death. So get that thought out of your head, just because it doesn’t happen too often, doesn’t mean it doesn’t happen. That is how the bicycle lobby works, if their is very small numbers, it doesn’t exist, even if it is documented. Pedestrian fatalities are often the fault of the pedestrian. The best thing you can do is look out for yourself, don’t expect the world to stop because you are a pedestrian, or cyclist. There are very few intersections in the denser parts of New York without a 4-way traffic control, so in most cases no one would have to stop on a dime for anything. They’d either have a red light or a stop sign so they would be stopping anyway. There’s a huge difference between “ignore” and “treat as a yield”. Sure, pedestrians and cyclists should absolutely look both ways before passing red lights. In fact, they should look before passing green lights simply because some drivers run red lights. I’ve avoided collisions by doing exactly that. 1) They may well be staged. 2) Even if they’re not, they don’t show typical behavior. I could find lots of videos of drivers ignoring red lights without even slowing down but this doesn’t mean it’s typical behavior. Most drivers stop at red lights, and most cyclists/pedestrians look both ways before passing red lights. You’ll find news on it here too except it’s such a rare occurrence it hardly happens. On average less than one pedestrian a year is killed by a bicycle in NYC. I’ve yet to see a motorist who was killed by either a pedestrian or a cyclist. At worst cyclists and pedestrians can be a danger to each other if they’re careless. They’re not a danger to motorists at all. Save these people from themselves? The sole goal when I hear motorists talk about “educating” cyclists and pedestrians is they want the road clear of them so they can speed. If you want to drive fast go on a highway where pedestrians and cyclists aren’t allowed. On urban streets we should use mostly street design (and some enforcement) to do things like discourage driving in the first place, encourage slower speeds, and encourage drivers to actively look all the time. That means getting rid of traffic lights because they put drivers on autopilot. Of course, many drivers are against that simply because getting rid of traffic lights means it’s unsafe to drive more than 15 or 20 mph. Vision zero shouldn’t be mostly about enforcement anyway. That’s why it’s an epic fail. It should be mostly about redesigning streets to be safe even when humans make mistakes. Sure, there will be times a pedestrian or cyclist doesn’t see a motor vehicle. And there will be times a motorist doesn’t see a pedestrian or cyclist. If the street design encourages the motorist to go 15 or 20 mph, then chances are great nobody will die when this happen. Vision zero needs to be mostly about infrastructure. We need enforcement too, but it should focus on the most dangerous street user, namely motor vehicles. New York isn’t known for using commonsense since it is pretty far left to the max. It sounds like you didn’t read my post before replying. This is standard practice for this guy – he’s a serial troll that searches for bicycle related articles to take a dump on. He originally posted as “noname” and he’s gone through several screen names. You remember noname, right? This is the same guy, back with a new alias. He doesn’t believe that car drivers should ever need to take responsibility for anything. He doesn’t believe that car drivers should ever need to take responsibility for anything. He and many others, alas. The sustained reduction in fatalities should bolster the political case for moving forward with bolder street designs more rapidly. Mayor de Blasio says dedicated bike lane enforcement teams aren't worth the city's limited financial and personnel resources.